The Duke and Duchess of Sussex today braved the snowy and very cold conditions to visit Bristol. The Duchess bundled her bump up in a vintage coat, but also wore a fun printed dress by Oscar de la Renta. The Duchess wore a William Vintage ‘Flared Peacoat.’ The coat has small thin yolk, front placket with large buttons, long sleeves, diagonal welt hip pockets and flares out into swing coat style. This could place the coat’s make between the 60’s or 70’s, as the peacoat and swing coat styles were very popular during these decades, but the fabric of the coat does look quite modern. The beautiful feature of the coat is the long sweeping drape over the shoulder and down the back. The retailer stocks a wide array of beautiful, glamorous and enviable vintage pieces both through their store and online retailer Farfetch. Below we show a coat from their online store and Farfetch. Humanitarian Lawyer Amal Clooney is known to be a huge fan of the label, having worn vintage pieces from William Vintage on numerous occasions. Amal’s outfits are available to view on William Vintage’s Instagram page and fingers crossed they may add Meghan’s. Meghan wore Oscar de la Renta ‘Enchanted Forest Dress’. The black sheer silk chiffon dress has a deep v-neckline with small buttons that lead to a cinched waist, and has a self-tie belt and long sleeves with extended cuffs. A long, floaty skirt reaches to a ballerina length. The dress features a colourful eclectic print of animals, birds, unicorns and flowers. This gorgeous whimsical dress is a very fun piece from Meghan, and she shows us there is more to her style than capsule monochromatic ensembles of black, navy, blush or cream. We adore this pretty and feminine dress, a great choice. 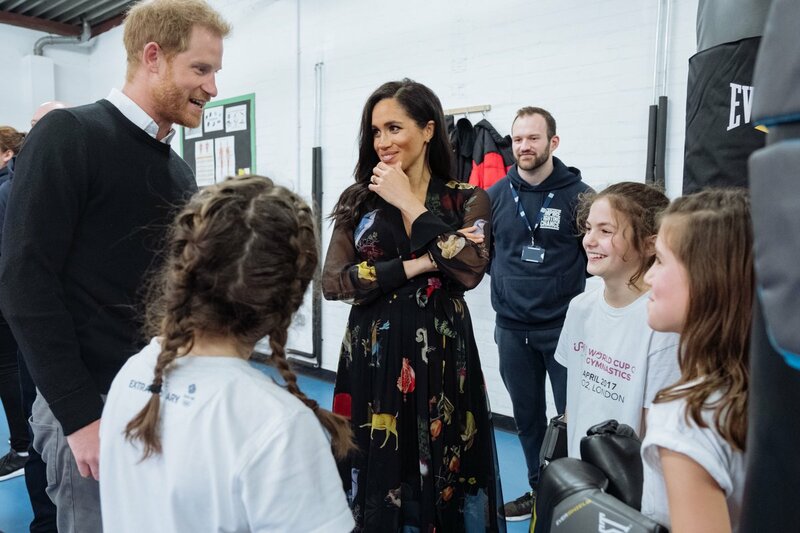 The Duchess’ dress is sold out, though you can still view it here and we love this as a cheaper alternative to the piece – get it here. Meghan added a new pair of olive suede boots from one of her favourite shoe designers, Sarah Flint. Meghan wore the ‘Marina’ style in Olive Crosta leather, retailing for £530. The rounded toe knee-high boots showcase a double loop at the rear of the boot and end in dark wooden tapered 85mm cone heels. Whilst we love the sleek look of these boots from the side, they appear a little slouchy at the front and would love if they were slightly more fitted all over. You can purchase Meghan’s boots here. Meghan accessorised with her Pippa Small ‘Herkimer Diamond’ earrings. We first saw these gold stud earrings worn to Princess Eugenie’s wedding. Herkimer is type of quartz, therefore each pair of earrings will have a slightly different shape. Meghan wore a a UFO gold disc necklace that appears to be engraved with an evil eye. The Duchess carried the same olive suede cross-body bag/clutch she took to her nephew, Prince Louis’ christening; it looks to be Ralph Lauren, the same designer worn to this event back in June. Meghan also carried a pair of almond coloured suede gloves in a midi length. The gloves appear to have a small gold logo plaque at the end but the designer’s name can not be made out. We love that Meghan choose a vintage piece. There is nothing quite like the quality and craftsmanship of vintage clothes from Fashion Houses of a bygone era of glamorous, sophisticated dressing. Meghan has us wanting to jet off to Paris to rummage for a vintage piece of Dior or Chanel.